If you or someone you love is challenged by difficulty in communicating, help from a Speech Therapist can make a difference. Through treatment, patients are able to handle speech difficulties better and may even be able to fully gain normalcy in communication skills. Our speech therapists can also extend the treatment to family members so that everyone can better understand what the patient is going through. 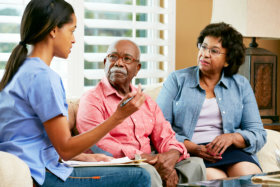 You can get the treatment you require with home health care services. Let us know how we can help.